Celebration of Life Services for Sumner L. Cowan, SrA (retired), 27, of Valdosta, Georgia, will be held from 2 to 4 p.m. Saturday, December 5, 2009, at Michaels Funeral Home, 800 S. Roselle Road (between Higgins and Irving Park Road), Schaumburg, Illinois. Interment will take place in Arlington National Cemetery. Sumner was born September 29, 1982, in Fayetteville, Arkansas, and passed away Saturday, November 7, 2009. He graduated from Schaumburg High School in Schaumburg, with the Class of 2001, and attended Harper College in Palatine, before entering the Air Force. During his enlistment he had served in Balad and Kirkuk, Iraq. He was on the ground during the initial elections in Baghdad, and for a time was embedded with the Army. Sumner had been assigned to the 823rd Security Forces Squadron at Moody Air Force Base, Georgia, since 2005, and was medically retired in April 2009, due to injuries sustained in Iraq. 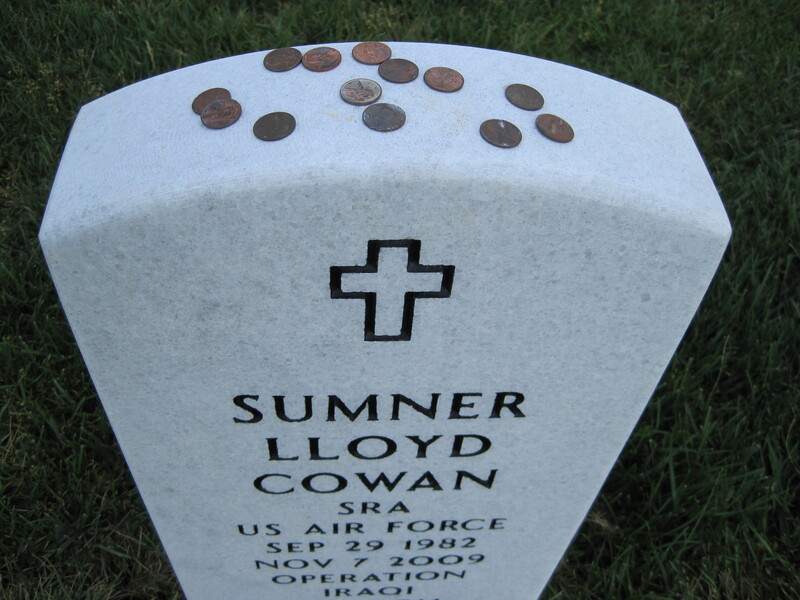 Sumner proudly and loyally served his country, and had received many honors, awards and commendations for his dedicated service. Most recently he was attending Georgia Military College in Valdosta. Sumner is survived by his parents and stepparents, KerrieAnn (Craig Skuran) Mayes-Skuran of Schaumburg and Thomas L. (Selma) Cowan of Woodbridge, Virginia; one sister, Angelica Drumm of Woodbridge; two brothers, Thomas L. Cowan II and Ernest D. Cowan of Woodbridge; numerous aunts, uncles and cousins; and stepgrandparents, Victor and Mildred Skuran of Glenview and Generosa Nery of Angeles City, Philippines. He was predeceased by his maternal grandparents, Ralph and Louise (nee Mack) Mayes and stepgrandmother, Jodie Lindley Mayes; and his paternal grandparents, Harold and Alma (nee Pyle) Cowan and stepgrandfather, Ernesto David. "In lieu of flowers, we would request donations be made in Sumner's name to a Veteran or Veteran's organization of your choice. Please realize that donations do not have to be monetary. A donation of time through volunteerism, hosting a service person for a holiday meal or even putting together a care package means so much." For information, please call 847-891-2900 or visit www.michaelsfh.com. His buddies called him "Truck" for his linebacker physique, his fierce loyalty to friends and his determination to forge through pain without complaint while serving as a Senior Airman with the U.S. Air Force's security division. 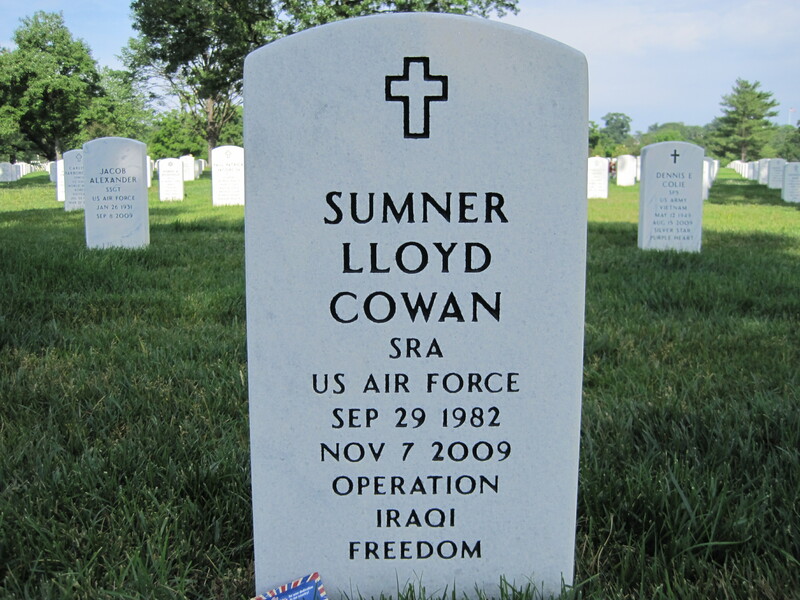 But after Sumner Cowan suffered debilitating shoulder injuries during combat in Iraq, the Air Force retired him in April 2009, saying that, at age 26, he no longer was medically fit to be deployed. Devastated, Cowan found it difficult to return home and redirect his life, family members said. 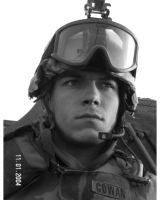 The 2001 graduate of Schaumburg High School had survived roadside explosions and mortar attacks during five years of service to his country. But in the end, he could not live with himself. On Friday, family and friends celebrated Cowan at his funeral at Arlington National Cemetery in Virginia, where he received full traditional military honors despite the fact that he didn't die on a battlefield, but as a civilian on home soil. His body was found outside a friend's home on November 7, 2009. Cowan, 27, had shot himself in Valdosta, Georgia, where he was pursuing studies in criminal justice. "He felt he wasn't where he should be at this point in his life," said his father, Thomas Cowan, a retired Air Force Major who said he believes the system failed his son. 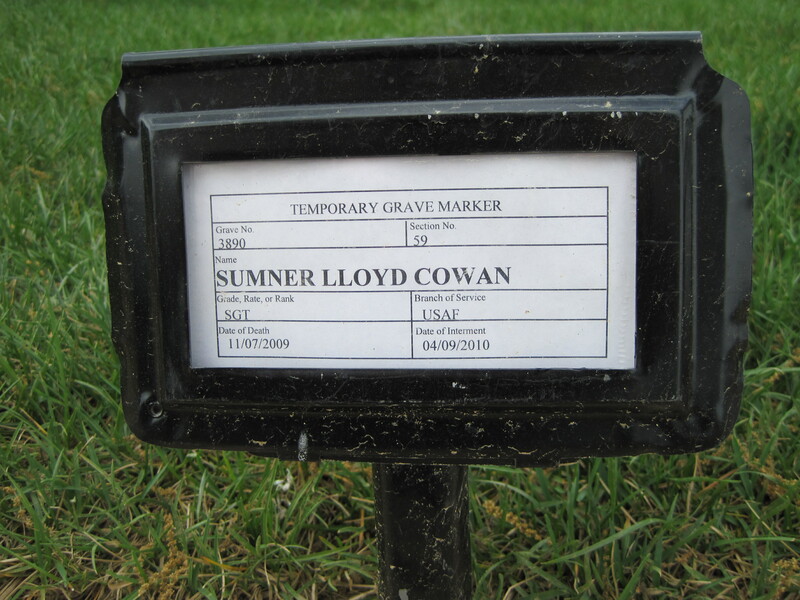 Sumner Cowan, a former high school wrestler, had proudly followed in his dad's footsteps, choosing to work in security forces -- similar to the Army's military police, and repeatedly risked his life for his country, his father said. "He wasn't thrown out of the military; he was medically retired," said Cowan of Woodbridge, Virginia, who refers to his son as a "thrown-away hero." Those words do not come easily to Cowan, whose family's military ties run deep -- he is related to the famed war correspondent Ernie Pyle. About 70 people attended Sumner Cowan's funeral service at Arlington, beneath blue skies and amid spring blossoms. His parents placed white roses on the marble rectangular urn that contained their son's ashes. Among those paying last respects was Army Brigadier General Jeffrey Horne. After reading a Tribune article about Cowan's death in January, Horne asked the pair to meet with him in Washington, D.C. He spent 2 1/2 hours listening to the family's perspective, with hopes that the military can improve services for veterans trying to transition back into the civilian world, Thomas Cowan said. Officials are trying to find ways to link veterans with jobs and coordinate services that help with issues ranging from mental health to financial needs, said Sumner Cowan's mother, KerrieAnn Mayes-Skuran of Schaumburg. While an Army official said it is too early to discuss the effort, Mayes-Skuran said she feels confident Horne's office is working diligently on a proposal that includes input from families such as hers. "The military and government are huge, and things don't always work as fast as we would like them to, but they are trying," she said. "It's not just the suicides but the things leading up to it." Mayes-Skuran and Thomas Cowan, who are divorced, remain disappointed that the Air Force did not follow up with their son after he was discharged. When asked to respond, the Air Force issued a statement, in which it declined to address the specific case. "Our hearts go out to Airman Cowan's family as they cope with the loss of their loved one," the statement said. "In all Air Force wounded warrior cases, a team of professionals frequently reaches out to the wounded, ill and injured airmen to provide support and assistance to them and their families." The military has set up rigorous suicide-prevention programs and advertising campaigns, trying to reduce the stigma associated with mental health problems, officials said. But because each branch offers its own programs, the challenge to integrate resources and make it easier for veterans to find them remains. Those who slip through the cracks often suffer injuries that are not as obvious as physical dismemberment, officials said. In 2009, the Pentagon counted 301 suicides among active-duty soldiers, the most since tracking began in 1980. The number includes 160 soldiers, 52 Marines, 48 sailors and 41 airmen. The Veterans Affairs department also has reported that the suicide rate of men from 18 to 29 who left the service increased 26 percent from 2005 to 2007. Sumner Cowan's death would not be counted by either agency, as he was not receiving service from a veterans health facility, officials said. Chris Bonar, who graduated with Cowan from Schaumburg High School, said that he considers his friend's death the result of injuries suffered in war. "It changes everybody. It's war. That is the cross that we bear as service members," said Bonar, 28, a soldier stationed at Fort Lewis, Washington. Thomas Cowan, who spent time in Saudi Arabia during his military career, said he thought his son talked to him about almost everything. "I was one of the few people he knew who had been there, had tasted the same sand, had experienced the same things," he said. Cowan said his son discussed how he suffered some of his injuries, riding in the gunner's seat in a Hummer. As they responded to an attack at night, their vehicle hit a ditch and Sumner bounced around, slamming into a gun mount on one side and a rifle on the other, his father said. "I love him and he's my hero, but I am still trying to make sense of it," Cowan said. "I know he's no longer in constant pain."